For beginners and advanced lifters alike “how much protein per day” is an important question and a topic that has been debated intensely for decades. You would think that since this is a topic that has been debated so much and probably is quite important to know that researchers have found a clear answer by now. That is, however, not the case. While top experts and researchers definitely have made great progress and in my opinion have provided some really good guidelines, there is increasing evidence that it likely depends on several factors including (but not limited to) protein type and quality, age, muscular development, timing and whether you are in a calorie deficit or surplus. These things are beyond the scope of this post but I will be covering it in the future. These things are beyond the scope of this post but I will be covering it in the future. However, what the research also shows is that while these things probably matter they are not that important. The most important thing and what all experts agree on is that you get a reasonable amount of protein on a continual basis (every day). Before I dig down in protein requirements for strength and muscle I want to emphasize that protein really is for so much more. Proteins are large biological molecules consisting of long chains of amino acids. Most of these amino acids the body is able to produce by itself with the exception of 9 amino acids that must come from the things you eat. These 9 amino acids are also known as the 9 essential amino acids. Proteins are found throughout the whole body and it is estimated that a human consist of 50,000 different proteins which make up the majority of the body’s dry weight. If you think proteins mostly have something to do with muscles and muscle tissue repair you are very wrong! The many different proteins are responsible for a wide variety of things in your body including construction of enzymes and hormones, they are an important building block of bones, muscles, cartilage, skin, and blood and are used in their repair. Proteins are also used for hair and fingernail growth, regulation of hormone secretion, digestion, maintaining water balance, transport of nutrients to and from cells and carrying oxygen in the blood. Relevant official authorities and institutions around the world publish recommendations on all aspects of dietary intakes including protein. An interesting thing to take note of is that these recommendations actually vary between countries. This proves that these recommendations really just are assessments and interpretations of research that even the professionals themselves do not agree on. It would seem like a great idea to just follow these guidelines, but what research actually has shown in the early 90’s is that it is beneficial for athletes performing strength training to consume more than the US and Canadian recommended dietary allowance (RDA). Today, all experts and that can be considered knowledgeable on the subject agrees that people who regularly perform strength training can benefit greatly by eating an increased amount of protein compared to people who do not train. However, this should not be understood as a confirmation of the age-old myth that you need to eat a ton of protein every day if you want to see strength and muscle gain. Research clearly shows that this is not the case. 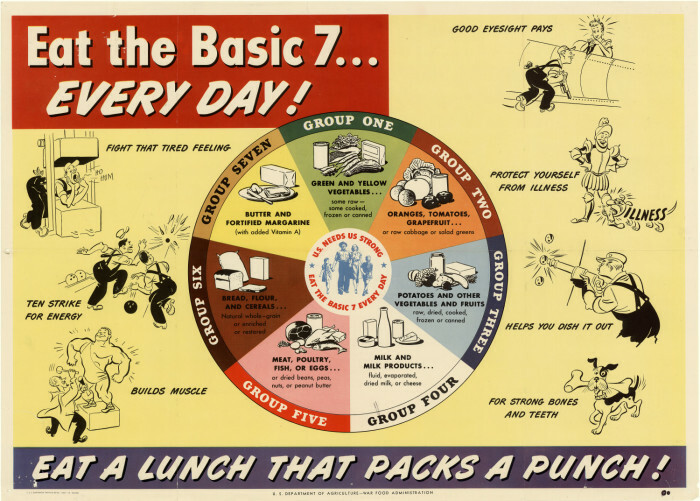 Eat the Basic 7– every day! : eat a lunch that packs a punch! What Do The Top Experts Say About Protein Intake? Studies and experts in this field do not completely agree with each other on how much protein should be consumed daily. Peter Lemon, Ph.D. and professor at School of Kinesiology, Western University in Canada stated in a recent review paper covering many studies that “the RDA for those engaged in strength training should be about 1.7 – 1.8 grams of protein per kilogram of body mass per day”. Peter Lemon is actually doing a new study on protein intake that should have been completed in December 2016. To my knowledge, the results have not bee published yet. Susan M. Kleiner, who holds a Ph.D. in nutrition and owns a consulting firm working with countless of professional sports athletes, states in her recent fourth edition of her book, Power Eating, that 1.6 – 2.2 grams of protein is recommended for building muscle. Based on this I would say it is safe to assume that as long as you are not eating less than this you should be fine. In my “Ultimate Strength Training Diet Plan” I state that most research has shown that there is no extra benefit for strength and muscle growth when eating more than 1.8 grams of protein per kg of bodyweight. It is no coincidence that its the same as what Professor Peter Lemon says. Furthermore, I argue that you shouldn’t go to extremes and eat a ton of protein just to be on the safe side since gaining strength and muscle also requires a lot of carbs and fat. If you eat a ton of protein that means you have fewer calories for carbs and fat unless of course, you have no problem with also gaining fat. So maybe now you are wondering why it is so hard to just give a clear answer to how much protein you should be eating per day. Protein intake is actually more complicated than you would think at first. I guess that applies to many things regarding the body and dietary choices. The human body is a complex biological organism and there is no answer that will fit all situations. Furthermore, there are actually not that many studies as you would think. Also, the studies done have a number of flaws that should be taken into consideration. Studies are mostly done on beginner lifters and not for a long time duration. Finally, the measures used in the studies only record short-term growth. These things are a concern since it is believed that protein needs change over time as the body adapts and strength and muscles are developed. Some of the more recent research shows that protein needs probably also depends on the kind of protein or amino acid and when you are eating it. Branched chained amino acids (BCAA) and especially the amino acid leucine has been shown to have some beneficial effects. Eating a meal containing protein and carbs within 2-3 hours after your workout has some evidence of being beneficial. Also, there is some good evidence that increasing protein intake while at a caloric deficit helps to preserve muscle. So, How Much Protein Per Day Should I Eat? As you probably understand by now the real answer is “it depends…”. But, don’t get stressed over all these details, which probably only make a small difference. The most important thing is that you are getting a reasonable amount of protein on a continual basis. Most of the research suggests 1.8 grams of protein per kg of bodyweight and I would recommend that you keep your protein intake around this number. You can go higher or lower, but you should avoid going too much lower. For more information on how much protein I recommend checking out my post on how to determine your macros the easy way. If you are looking for a complete guide on how to set up your diet, you can download my white paper titled “The Lean Muscular Physique Diet Blueprint”. Every gym rat becomes obsessed with protein so I’m sure this article of yours will be gold for a lot of folks. Good point on sharing the recommendationa by the dietary allowances. Personally I never focus too much on protein because as a meat lover I believe getting enough of if without much struggle. But I’m familiar with the common 1.8grs/kg and it sounds reasonable. Still, a protein powder helps all that much, don’t you think? It is good to have a basic understanding of protein requirements, but as you say if you are a meat lover and are sure to be getting enough then you better focus on other more challenging things! Brilliant article Marcus, it is very informative and its obvious that you’re into exercise and nutrition. I do exercise on a regular basis but I’m not too sure I’m eating all the write stuff. I were to show you what I eat on a daily basis then the vast majority of it you would label “healthy” but I’m not sure it actually is. I have no idea about my daily intake of carbs, fats, protein etc. Do you have anything, like a resource, that would get me started on the right foot? Hey Lyle. I am happy you liked the article. Also it is great to hear that you exercise on a regular basis! What I instead would recommend you do, is get more familiar with the macros in the kind of food you eat the most and think about getting a good amount of all three. You can read the nutrition labels and use a calorie tracker to get a good feeling. I recommend myfitnesspal. When starting out getting familiar with nutrition information can be overwhelming, but just take it slow. It will take some time, however it is worth it. It will make it much easier for you to eat exactly what you want while still gaining strength and muscle and keeping fat to a minimum. Very informative article here, as a lifelong athlete I’ve always wanted to know how much protein do I really need. Like you stated in this article the experts in this field do not agree with each other. I would read a few articles which would contradict each other and I would be really confused at the end. You stated that most research suggests that 1.8 grams of protein per kg of bodyweight would be ideal, this is good to know, thanks for this information. Great you found this article useful! I think 1.8 grams of protein per kg is a good rule of thumb based on the research, but don’t misinterpret it as a minimum requirement :p You want to have plenty of room for fat and carbs in you calories as well. This is a good, basic guideline for protein consumption. As a former gym rat, I’ve seen all kinds of “advice’ on how much protein to eat, in addition to the various sites touting the basic amino acids. In my case the 1.8 – 2.0 grams per Kg or weight works well. I even went over what I ate today so far and I’m right on track. I also believe that an equal amount to carbs will give you the fuel and energy to get the most from your workouts and your everyday life. Thanks. I have never been into the amino acid thing. Until now I haven’t found a good enough argument and evidence that for me justifies taking it. With 1.8 – 2 grams per kg you are definitely on right track 😉 But yeah, carbs are also very important!